nails. The light of my beloved will keep me from noticing. Walked over the scorch; what are values when there's nothing here? pouring outcomes over the eager cash flow promotions. covered my visage, l'm too near you. Dont you want to see! said you were a failure, but you helped destroy us. why are you here when there's nothing? We just dont believe it. are prized for not existing except as a body, now not. before the auctions began. Her face then was large and younger. will have to live off bits of you. We shake all the time. You remind me of someone else I knew. redemption, because we are more than redemption. I am my maker. The shape formed by the bits of mirror glued on is unimportant. They're inside my chest and stomach, and they glitter in there. about words. You knew I wasn't. Had read every the book of before they arrested me. returning within its white petals and central whorl. told him, but he refused to believe it; then I left the room. peculiar invention betrayal, how primal was that? so I could find what they thought, even if babies only cry. butterfly of lace with an empty length to bifurcate my symmetry. change our silence into the beautiful city of a voice. 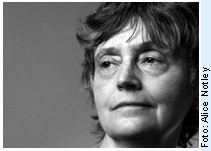 Alice Notley has published over thirty books of poetry, including (most recently) Culture of One and Songs and Stories of the Ghouls, and the chapbook Secret I D. With her sons Anselm and Edmund Berrigan, she edited both The Collected Poems of Ted Berrigan and The Selected Poems of Ted Berrigan. Notley has received many awards including the Academy of American Poets’ Lenore Marshall Prize, the Poetry Society of America’s Shelley Award, the Griffin Prize, two NEA Grants, and the Los Angeles Times Book Award for Poetry. She lives and writes in Paris, France.